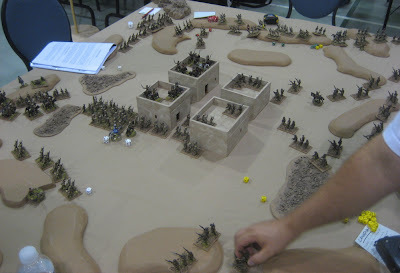 I had previously mentioned the idea of running a mini-con or invitational wargame weekend (Here). I’ve been doing some more thinking about this and thought I ought to start setting things down in stone (or at least pixels…) planning-wise. Tentatively I am planning for the weekend of 22-23-24 February 2008 (though there is a slight chance this may be moved up to the last weekend of January – depending on the availability of some potential participants). While I had alluded to the idea of a campaign or theme weekend, I think the format I’ll use for the first one is an “open gaming” weekend. 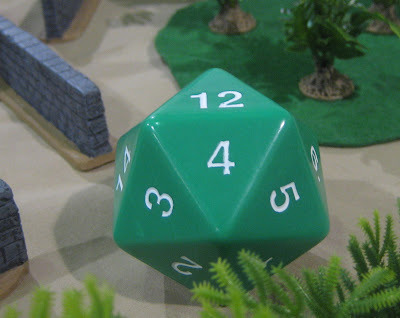 In the future I’d like to run mini-campaigns of a series of 4 or 5 linked scenarios. I just don’t think I’m going to have enough stuff together for one by the time the new year rolls around and I promised myself I would no longer volunteer to run games for conventions (even my own!) that I don’t have all the stuff I’d need for the game ready to go at the time I promise to run them (so there’s no frantic late-night painting for the week or two prior to the convention just to get things finished up!). The exact games that will be run will depend on who else volunteers to run games and what stuff I have ready a little closer to the weekend when I firm up the schedule. My goal is to have enough games planned and ready to go so that if all the other people that have offered to run games bail at the last moment there will still be a weekends worth of games to be played! So for an “open gaming” format it would be ideal if I had 4 or 5 participants. Each could run one game during the weekend and the others could play. That way everyone is guaranteed to play at least one game that they love (their own! – though hopefully all will be interesting) and have 4 or 5 committed players. If somehow I ended up with more than six I could probably open up a second table in my garage or in the downstairs kitchen and there could be a choice or two games in each time slot…. Just like a “real” convention…. 6:00 – meet at my place for supper – Tim’s yummy home made pizza! Blitzkrieg Commander – either in North Africa or NWE involving British Paras. Cold War Commander – Vietnam, Modern Africa, World War Three in the late ‘80’s. 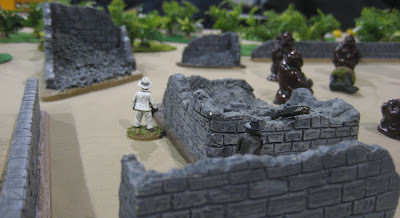 Savage Worlds – either an historical skirmish – Vietnam, Modern Ops, World War Two, etc, or some sort of Pulp Adventure or Victorian Horror game. Obviously I have a lot more stuff, but this it what I have that I’d be willing and able to run for a group of up to six. I’ll firm up exactly what I’m going to run and what each scenario is about, as we get closer to the New Year. As I said I’m going to plan to have five games ready to go, however if anyone else wants to bring and run a game that would be cool too! You need to provide or arrange for all the materials required to play. The game you run should be simple and fast-playing. Simple enough for an idiot like me to be able to pick it up and play it with no previous experience. Fast-playing enough to bring the scenario to a satisfactory conclusion within the allotted time and also to keep everyone on their toes and involved and not wandering away from the table. You should be able to organize your game in such a way that it could be able to accommodate between two (you and me) and six players, as I have no idea right now how many people might want to show up for this. Game length: maximum of 3 to 5 hours depending on which time slot its in. 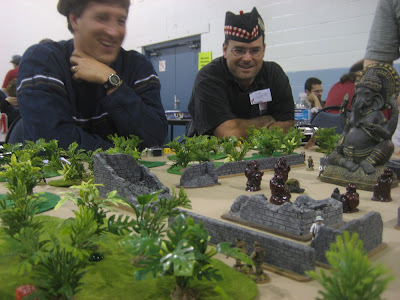 I’m going to say I’m not going to limit games to miniature war games, though that is obviously my preference. I could be talked into a board wargame. It should meet all of the criteria above – fast-playing, simple, accommodate 2 to 6 players…. (So yeah, John, you could bring some sort of C&C game and run a big multi-player battle..). Stay tuned for further info as the next couple of months roll by… If you’re interested in attending let me know. Once again any questions, comments, ideas, etc. please feel free to post them below! As I mentioned a week or so ago my plan for the next month is to take stock of all the figures I have (painted or not) and make a loose project plan for the next year. I thought I’d start with the 20mm figures as that’s what I’m most stoked about right now. I’ll be using these with Cold War Commander. The idea is to put together a number of versatile forces to cover a number of conflicts or potential conflicts. The soviets, for example, could be used for the war in Afghanistan, Red Dawn/World War Three games, and their equipment could be used by any number of Middle East or African forces. 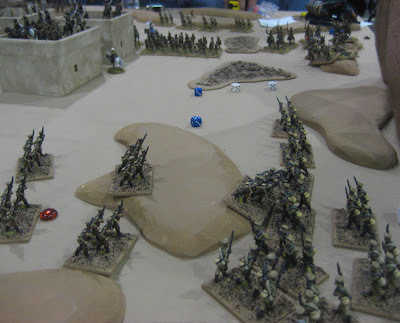 Lower level conflicts/actions seem appealing to me so I would probably be using a figure/model scale of one infantry stand = one section and one vehicle or gun model = approximately two on the ground. I think tonight I shall start with the British and French…. Why Brits….? Well, being a super-power (or former super-power – depending on who you’re asking…) with fairly strong ties with their former colonial possessions, they’ve been “involved”. There are loads of conflicts they’re actually been involved in and many, many more potential/”what if” conflicts they could be used in. I’ve been particularly inspired by Fireman Tim’s Cold Wargaming Blog. 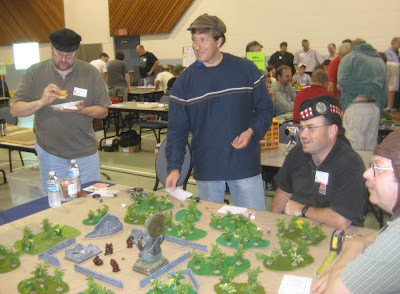 Checkout the Red Dawn scenario ideas – in the July 2007 Blog Archives! Something about fighting Russians in the Rockies or on the Canadian plains tickled my fancy. 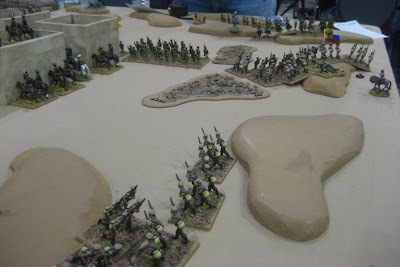 I thought a British Battlegroup could slide really easily into a campaign like that – they could be a battlegroup that just happened to be training at BATUS when the Russians launched their surprise invasion! I also imagine they could be used with my African armies – a task group being brought in to protect British interests in some small African country spiraling down into chaos.. I debated whether to do them in temperate or desert DPM. In the end I decided to go with temperate. I decided that really I’m just not interested in the Gulf War (episodes I or II) – which is pretty much all there is to do with guys in Desert DPM. The tropical DPM is identical to the temperate (just lighter weight) if I wanted to dump them in a jungle somewhere. Considering the locales I envision them operating I decided to go with Temperate DPM (Actually I was at CFB Wainwright – in Alberta - in the summer of 1992 taking an MSE Op course and there were British training there and they were using Desert DPM out in the field… but… whatever…). Next I had to decide SA-80s or FNs. I’d have liked to go with FNs all the way. That would have made them useable for the Falklands. I have about a company’s worth of guys armed with FNs. However, as there are cheap plastic figures with SA80s readily available, the bulk of my force, for the time being, will be thus armed, making the nominal date of my forces late ‘80’s and beyond. The French are interesting for many of the same reasons. I’d like to have a few for intervening in Beirut or Tchad (or Timbogo…!?). So early ‘80’sish Legionnaires in OD uniforms (maybe even shorts!) and not so much body armour. 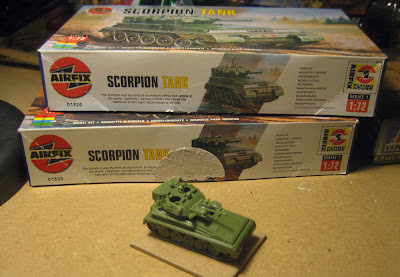 I have three Airfix Scorpion CVRT kits. Conveniently the kits can be built as either a Scorpion or a Scimitar. I’ve assembled one as a Scorpion, leaving all hatches open for adding turret crew and driver in the future. The other two kits I will build as Scimitars. 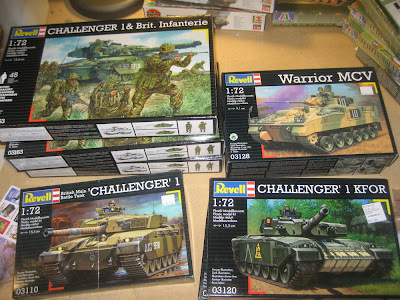 I’ve picked up some other equipment for the Brits recently; Six Challengers, including two with reactive armour. Three of the kits come with sprues of infantry – enough for three more companies of SA-80 armed infantry. For painted and ready for action troops I have exactly two stands of Platoon 20, SA-80 armed British infantry (these are quite old. I ordered them from Platoon 20 back in 1991? That’s the original paint job, though they have been rebased recently)…. …and two platoons worth of the 1:72 plastic Revell figures (plus two command stands). I have a couple more Combat Miniatures figures to make up a couple more HQs or to add to an infantry stand. The French… I recently picked up this Heller VAB 4x4. Wish I could find a few more. I’ve also ordered a pair of ACE AML-90 from Models UA for some additional light armour support for my Legionnaires. Should be here in the next week or so. Where to get more Frenchmen (or I guess I should say “Legionnaires” as technically they’re not really “Frenchmen”…)? I have a feeling I may have to make my own – which will be my first attempt at doing 20mm figures…! --Recce Platoon: ? more infantry? Use some of the Special forces that I HAVE? 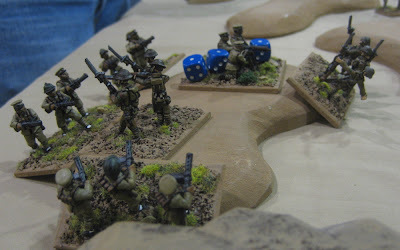 For the French… well… I have a nice little force to guard embassies or other French interests – but eventually I’d like to field a battalion of the FAR (Force d’Action Rapide) – like, say, the 2e REP! 4x VLTT trucks with 12.7MG - NEED TO GET? 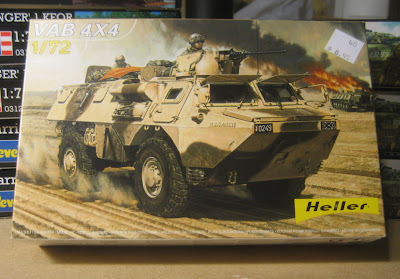 VAB 4x4 APC- HAVE: 1 to assemble and paint, NEED TO GET: 2-3 more? Heller! 81mm mortars! – Priority one! I have just about everything I need to field a Light Role Infantry Battalion circa 1990 except the mortars. 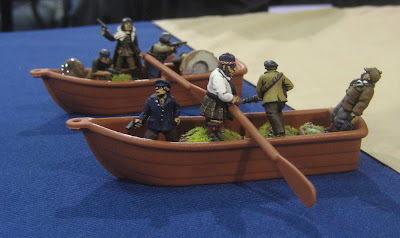 Either FAA or Liberation miniatures have suitable miniatures. If the crews don't have small arms they could be used for either force! More Warriors – Okay I’m probably NEVER going to have enough to field the entire battalion – but a companies worth might be nice. I have two, at least three more would do the job for now. 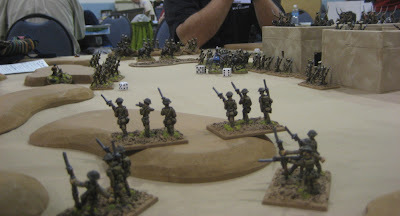 The french aren't a huge priority right now... nothing is really "NEED TO"
Like I said a British SP gun would be nice to stick at the table edge to show the artillery in Direct Support. Cromwell makes a 105mm SP Abbot. 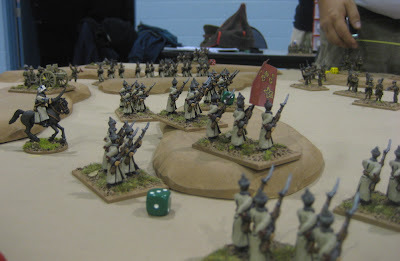 For the Battlegroup’s CO stand I was thinking Cromwell’s Sultan might do the job…? As I mentioned before I don’t know of anyone still making appropriate infantry models so I’ll probably have to make my own… maybe for mortars and Milans and other support weapons I’ll pick up some generic looking Liberation Miniatures and convert as required…? Some more VAB would be nice. Anyone make an AMX-10 RC…? 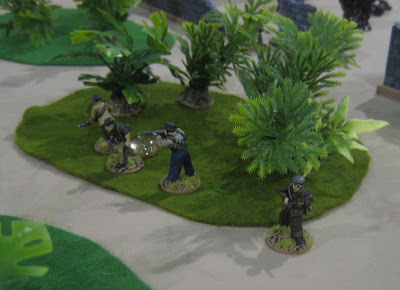 More 20mm Cold War/Modern stuff: Vietnam, Canadians, Americans, Africans, Russians, etc! 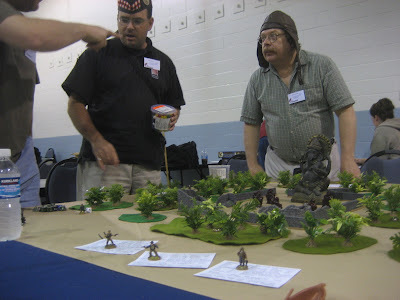 On Sunday I ran the second of two games I ran at Fallcon. 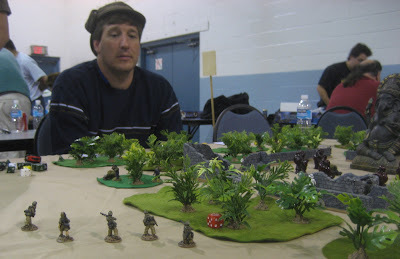 This was a Contemptible Little Armies/Back of Beyond game involving four armies which were trying to take a small town in Northeast Asia around 1919. The forces involved included White Russians, Bolsheviks, Chinese Warlord, and Canadian interventionists (yes, I know they just sat in Vladivostock getting sick and wanting to go home – it’s a “what if” type scenario…). Terry, playing the Bolsheviks, got to wear my Budenovka. Here he is keeping a close eye on the advancing Canadians. First wave of the Chinese Horde! 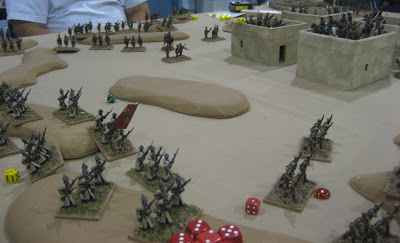 The White Russian Cossacks charge onto the table. The Bolsheviks advance on to the table. Uh… so… horses on the rooftops…. The four buildings were treated as bad going area templates. Whoever controlled a majority of the buildings at the end of turn ten would be declaired the winner – if no one had a clear majority we would continue play until someone did! 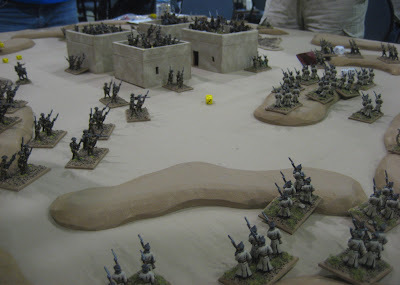 Will made a bold move of charging his Cossacks to the town and dismounting them to occupy the buildings. I didn’t have stands of dismounted Cossacks to substitute in, hence the horses on the rooftops. 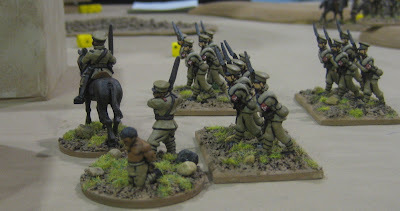 I thought it was particularly bold because it left him rather thin on the ground and by bringing them on he risked not getting his other troops left in reserve until much later in the game (if at all) as they had poor tactical ratings – which had to be diced equal to or less than for them to show up. On the left White Russians have occupied the town and Chinese are moving in. On the left Chinese and White Russians clash in the open. 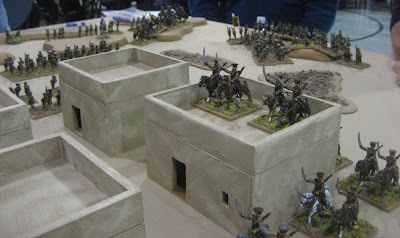 Chinese cavalry about to enter an already confused melee. 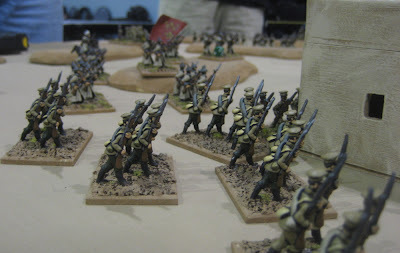 Chinese infantry had attacked a Russian MG. Russian infantry then arrived from reserve and attacked the Chinese infantry…. 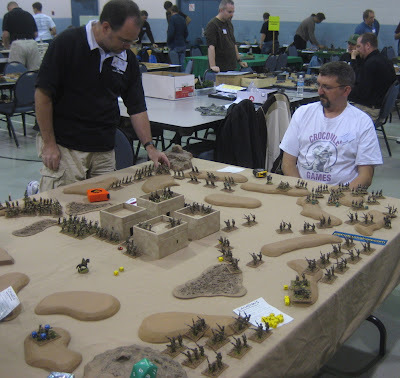 Will (left, playing the White Russians), and Terry (right, playing the Bolsheviks). A general view of things. Going clockwise from the top of the picture are Bolsheviks, Canadians, Chinese, and White Russians. The Chinese arrive at the town. At the bottom of the picture there are white Russians clashing with the traitorous deserters! Bolsheviks and Candians continue to fight. 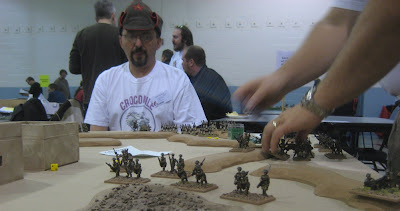 At this point the White Russians have two buildings, the Canadians one and the Chinese and Canadians are about to start fighting over one – a struggle that would continue to the end of the game. Canadians in the foreground, Chinese and White Russians in the back. The fight for the town begins. 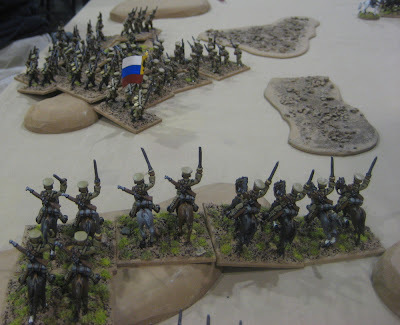 Brother on Brother – White Russians continue to slog it out with their recent comrades in arms turned traitor! Bolsheviks, Canadians, and White Russians again. The Chinese are slowly starting to surround the town. The Bolsheviks are creeping forward at a snails pace. White Russians are moving up to relieve the beleaguered Cossacks in the village. Bolsheviks and Canadians exchange small arms fire while fierce hand-to-hand combat engulfs the town. 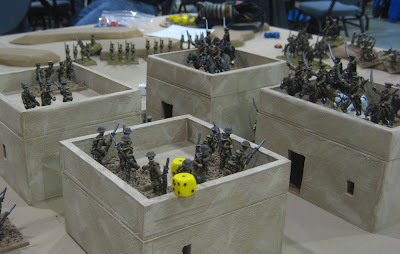 Canadians sent to deal with the Chinese machine-gun that is menacing their advance from their flank are further troubled by the arrival of Chinese specialist assault troops! White Russians make it to the village but without the numbers to make much difference. White Russian mercenaries in Chinese service, Chinese staff officer and executioner stand. Some of the house-to-house fighting in the town. On the ninth turn the Chinese cleared out this building/template giving them a clear majority. The Canucks couldn’t clear out the Chinese and retake the house to contest the village and prolong the game. The Chinese were declared the winners! Big thanks to those that played in my games, the organizers of Fallcon for giving me a place to run them and Mr. john Burt of giving me a place to crash for the weekend! Cheers! Taking stock and Game Plan ’08! 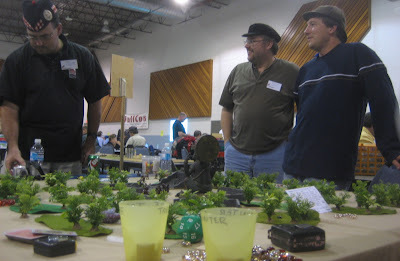 Saturday evening was the first of two games I ran at Fallcon. I ran a Savage Worlds Pulp Adventure game. 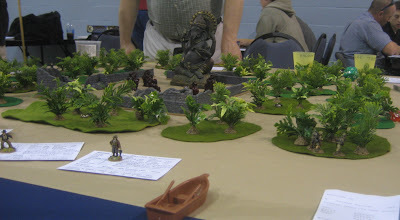 The scenario was very similar to a game I ran for the Local Savages back in January (The Lost Temple of Bo-Nong). I had about seven pre-made characters for the players to choose from (each with an appropriate hat for the player to wear). The participants all played members of an archaeological expedition Racing against time to recover the mystical Golden Idol before the evil Nazis (played by myself) found it or the volcano, Mt. Wannahawkaloogie, erupted. Scattered around the jungle and ruined temple were gold and green tokens. The gold tokens marked “searchable locations”. A character (or group) that spent it’s entire turn within 2” of a gold token could, as an action, search the area. A Notice check at -2 meant they could draw a chit form the treasure cup. One chit had “idol” printed on it, the rest had “no” (there were actually slightly less token than there were golden token on the table – just so they wouldn’t have to search EVERY location to find the idol – but I didn’t tell the players that…). Paired with each of the golden tokens outside the temple were green “encounter tokens” (there was also a single encounter token in the temple). Whenever a character or group entered the area it triggered a potential encounter. The player would draw a chit out of the encounter cup – some had “nothing” printed on it, others had the name of a critter or other encounter. There were dinosaurs, giant snakes, large jungle cats, angry natives… you name it! After the play-test I decided to give all the players five bennies – just to make them a little bit more “over the top” good. John Burt returned in his role as Marcus Andres, first mate of the SS Persephone (he also controlled the single group of extras the players had – four crew from the ship). Will Bailie played Jonathan (“Jock”) Hamish MacDonald, the famous Scottish Antiquarian. A bury Scottish gent with a fiery temper! Kurt Bertam was roped into playing at the last minute and took on the role of Professor Donald K. Stephenson, armed only with his vast knowledge of ancient languages and architecture and a rather sharp umbrella! Jerry (uh…. Aw dang, I’m sorry I totally forget his last name…) played Captain Charles Longstreet, Ace Pilot! Opposing them were Karl Von Kindershisse, Gestapo Agent, Der Ubersturmfuhrer, SS Superman, Mason R. Roberts, American Collector of Antiquities, Gunter and Hans, Gestapo Thugs, and a section of German Army Grenadiers. I told them they had 20 turns to get off the island before the volcano blew. The lads in the play-test didn’t make it…. Could this bold new group of players…?! 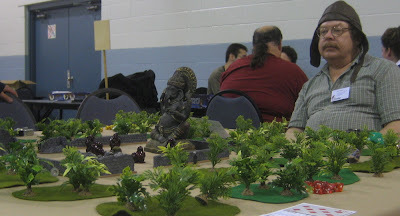 A view of the table with the jungle surrounding the Lost Temple of the Golden Idol. (L to R) John, Kurt, Will, and Jerry…. and, of course, another view of the table. 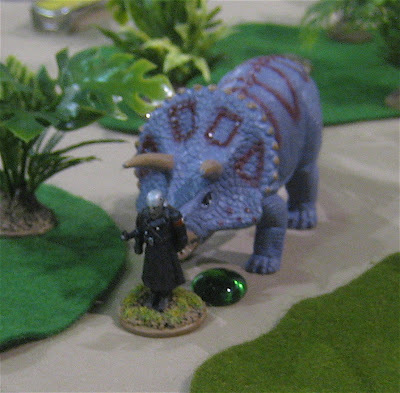 Early in the game, on the first of second turn, Der Ubersturmfuhrer triggered an encounter; a TRICERATOPS!!! After unloading his machine-pistol into it with no effect, he, and the other Nazis, decided to RUN!!! After a turn of that though I realized that they a) weren’t going to outrun it and b) it would kill them all rather quickly if allowed to run wild. So I thought I’d sacrifice Der Ubersturmfuhrer and maybe he’d hold it up long enough for the others to get some distance between them. So Ubersturmfuhrer stopped running, turned around and punched it…. killing it dead. I’ve never aced so many times before in my life…. That’s me, Tim Brown, playing the evil Nazis. This group of sailors sen three turns searching this stand of jungle – it was worth it, because when they finally passed their group notice check they drew the idol chit! John yelled “BOO-YAH! !” so loud that everyone in the convention hall turned to look out way. Afterwards there was a steady stream of people wandering by to see what was going on as, evidently we were having a lot of fun! The shoot-out in the temple. 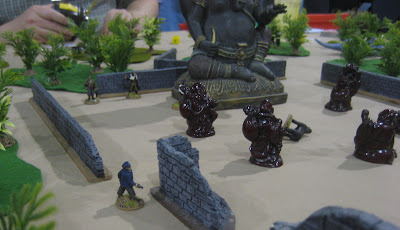 Marcus Andres, Professor Stephenson, Captain Longstreet, and “Jock” MacDonald (hiding behind one of the Buddha statues) all entered the temple to search for the ruins about the same time as Von Kindershisse and mason Roberts (who were just off to the left of this picture). A short gunfight erupted until everybody the jubilant shouts of the sailors (yelling “BOO-YAH!”) at which point they attempted to break contact and head for the beach. Here you can see Gunter and Hans sneaking around the outside of the temple, as well as the positions of von Kindershisse and Roberts during the gunfight. Again Kindershisse and Roberts in the temple. 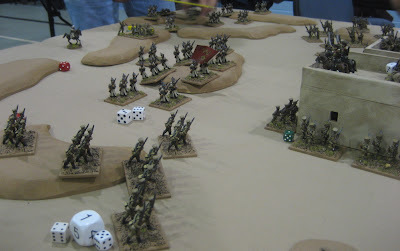 The German grenadiers rushed to the beach to try and block the heroes’ escape. Professor Stephenson would have none of this, so he dashed out of the jungle and poked one of the Nazis in the eye. Jock MacDonald has beaten down Roberts and Hans with his big stick and is about to do the same to Kindershisse. Andres had shot Gunter earlier. 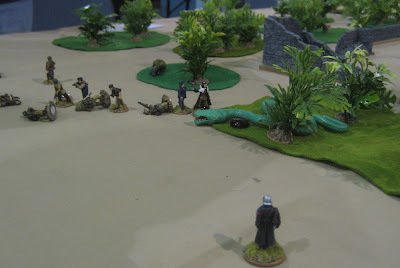 After bashing another Nazi in the head with his umbrella, Professor Stephenson dashed into the cover of the jungle only to find a Giant Constrictor already occupied it. The mighty umbrella was no match for the enormous snake and the professor quickly found himself… well… constricted. Captain Longstreet and Marcus Andres came to his aid! Around this time Der Ubersturmfuhrer made his way to the beach. Firing full auto into the melee between the snake and the three heroes he was bound to hit someone! He did. The snake. Three times. Killing it…. Der Ubersturmfuhrer was then, in turn, gunned down himself. All the heroes then dashed to the boats, loaded up and were away! 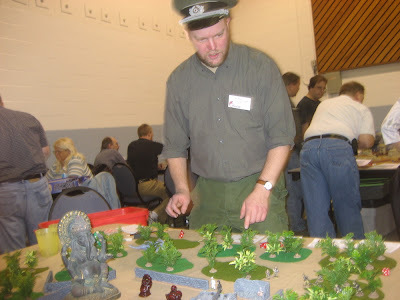 (well, okay, it was actually turn twelve when they gunned down Der Ubersturmfuhrer - the last nazi standing in their way - it probably would have taken them two more turns to get to the boat and another turn to get it underway... still well within the 20 turn limit...). A fun and exciting game! I don’t’ remember how long it took to play out but it seemed "about right" (not too long, not too short). Everyone stayed involved (and at the table!). I think the changes over the Mayday game made a big improvement. The most notable difference being that, for the most part, participants only ran a single wildcard (instead of a wildcard plus a unit each). 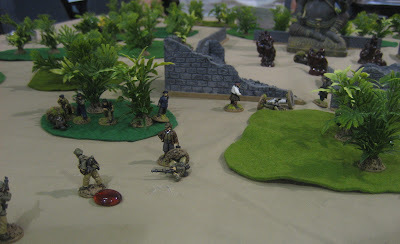 This sped up the game a lot as there were less players acting on each initiative round – as well as fewer bad guys going each round – as I didn’t need as many opponents to create a challenge for the players. 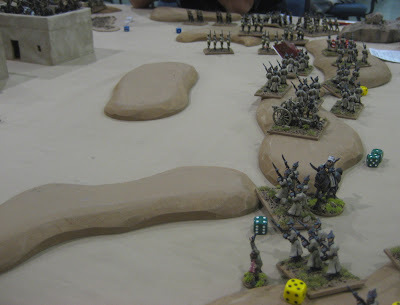 Next up: Part Three – My Contemptible Little Armies: Back of Beyond game.